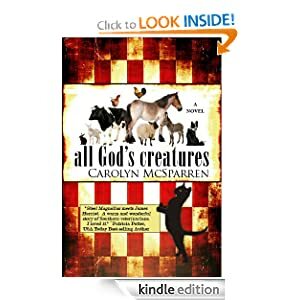 -- Often compared to the novels of James Herriot, ALL GOD'S CREATURES follows the life of a woman veterinarian in modern Tennessee. By veteran romance author and dedicated horsewoman Carolyn McSparren, who also writes the Merry Abbot Carriage Driving Mysteries. Say hello to Maggie McLain, an unlikely Southern debutante in 1960's Memphis. Gawky, restless, smart and opinionated, young Maggie isn't cut out to fill the patent leather pumps of a Southern Belle. When she ditches Cotton Carnival ball to save a drowning pup, Maggie realizes her destiny. Is the land of mint juleps and Elvis ready for a woman veterinarian? Maybe not, but Dr. Maggie McLain sets out to prove otherwise. Over the years, Maggie earns the devotion and respect of crusty farmers, snobby horse breeders and doubtful pet owners throughout western Tennessee. She's an inspiration to up-and-coming women vets, a loving wife to her proud husband, a patient mother to her demanding kids, and above all, a champion to sick and injured animals. When loss and grief knock Maggie off her pedestal, she falls hard. It may take a miracle for her to understand that sometimes even the best doctor must struggle to heal her own heart. All God's Creatures or to sample this book for FREE! Zoe Sophia is a girl who likes adventure and finds it during an exciting and event-packed vacation to Venice to visit her great aunt Dorothy Pomander. Zoe Sophia, along with her dog, Mickey, sees the sights, explores the city, and is involved in a suspense-filled search for her lost pet. Watercolor illustrations capture the essence of these two peas-in-a-pod, their enjoyable relationship, and the beautiful landscape of Venice, Italy. 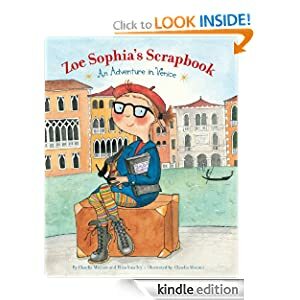 Zoe Sophia's Scrapbook: An Adventure in Venice or to sample this book for FREE! -- When the much-despised Marbury Marfan senior partner Simon Rafer turns up dead, with an ornate dagger buried between his shoulder blades, it comes as a surprise to no one. Simon was an abusive boss and had recently been on the warpath, clearing the "dead wood" from the legal firm he treated as his personal fiefdom. Nearly a thousand attorneys and associates, scattered across four continents, had good reason to want Rafer dead, but homicide Detective Spritz has his eye trained on Marbury Marfan partner Robert Tarza, in particular. Tarza and his friend and colleague --- and maybe a bit more --- Jenna are soon forced to play detective themselves, in a race to find the real killer or killers before Spritz finishes assembling a collection of evidence that will make a very credible case against Tarza. 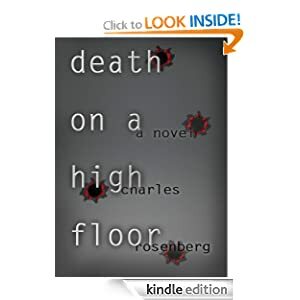 Death On A High Floor: A Legal Thriller or to sample this book for FREE! -- On the surface, Maureen’s life appears no different from any other stereotypical 54-year-old housewife's: a suburban home in a small Pennsylvania town, two loving kids, grandchildren, and a husband to dote on at the end of the day with a home-cooked meal and a crisp martini. Fat b~tch, dumb bunny, sl~t, tramp: these are just a few of the cruel words that echo in Maureen’s ears every day and define the harsh reality she actually lives in. For years, Maureen has harbored a dark secret known by only one other person: her husband, Tommy. After Tommy dies, Maureen imagines that the years of physical and mental abuse are over. But just six months later, while looking for the Halloween decorations in the attic, Maureen finds a gift-wrapped GPS with her name on the box: an early birthday present from her late husband. When the voice from the machine starts giving her sinister directions, she learns that sometimes the dead are restless... and she's locked in a battle not just for her life, but for her soul. Recalculating or to sample this book for FREE!